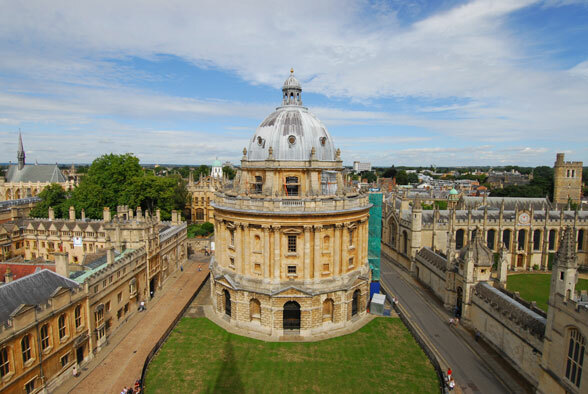 Oxford has always been referred to as the “City of Dreaming Spires” and if we take a look at the city from above, it’s easy to appreciate why it has earned this name. 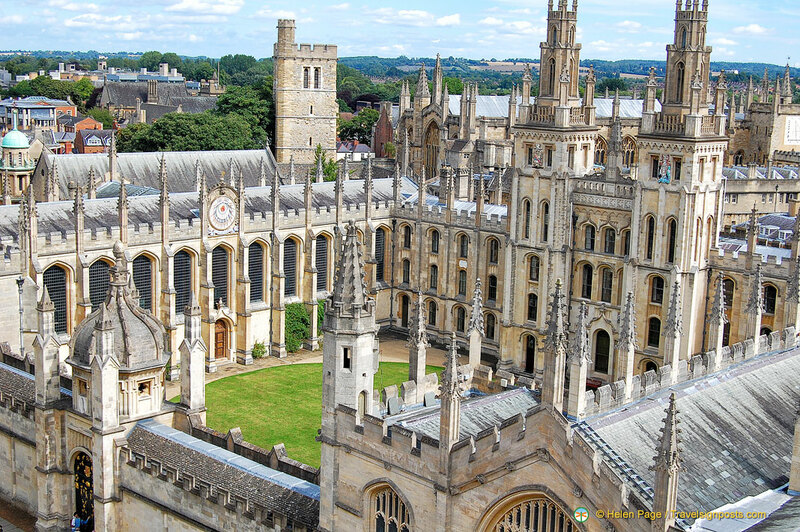 One of the best places from which to admire Oxford’s famous skyline is from the 13th century tower of the University Church of St. Mary the Virgin on High Street, commonly referred to as St. Mary’s or SMV. From the top of this tower you can enjoy uninterrupted panoramic views of the city and many of Oxford’s attractions. To get to the viewing platform of the tower we climbed 127 steps. The stairs are narrow and steep and there is not a lot of room for two people passing. So whenever we were passing someone who was coming down, we were faced with a very ‘close encounter’. But once at the top, the views are spectacular and rewarding. There is a very narrow walkway around the tower’s viewing gallery which is mostly wide enough for one person at a time. However, the walkway does not go all round so at some stage you’ll find people turning around and trying to squeeze past you on the way back to get down. From one face of the tower we had the best views of the Radcliffe Camera building and Radcliffe Square. Walking around to the next side we had views of the amazing spires of the All Souls College as well as views of the buildings along High Street. Don’t forget to also look at the architectural features of the tower at the top. If you’re interested in knowing what you’re looking at, you can buy the Church Guide Book from the Gift Shop before before you climb up. The guide book points out the major buildings to be seen. On this visit to Oxford, the weather was kind to us and the blue skies and white clouds formed the perfect backdrop to Oxford’s skyline. With the stunning views it’s easy to forget the time but with more visitors coming up to the top it was time to squeeze our way back down the tower. The entrance to the tower is from the Gift Shop. Pay your £4.00 and you’ll be pointed to the way up. We were lucky as there was no queue when we arrived. However when we got back down, a huge queue had formed to go up this hugely popular tourist attraction.